a small amphibian. Welcome to (nearly) dry land! I saw a flicker of movement under a log by the pond, so I moved the log. A small snake was revealed. He held very still while I tried to ease closer. 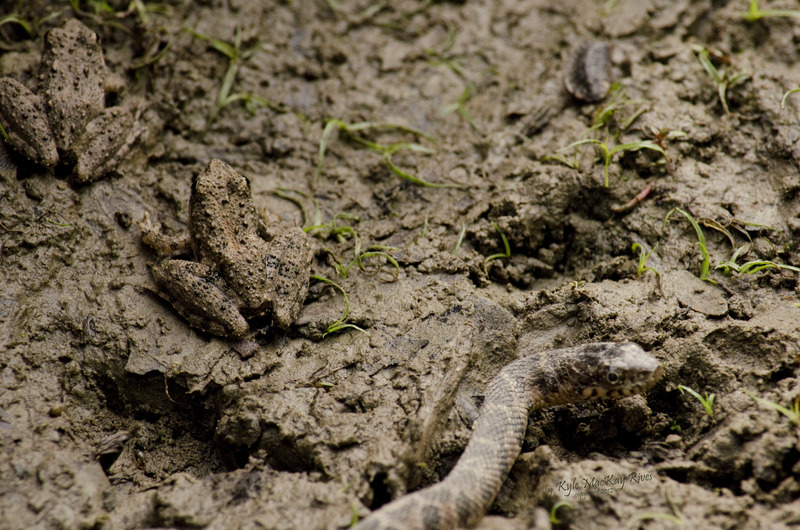 My movements startled two toads, which leaped over the snake… The snake was more concerned with hiding from me than with finding breakfast, so nothing happened. All remained very still. I guess I was holding still successfully enough to allow this little guy to relax. I was actually watching him, and not moving, when he began his little toady rhythm section. After my first photo I moved the camera. He instantly froze, little pouch still distended but not making music any longer. It deflated ever so slowly as he held perfectly still waiting for the danger to pass. Finally he concluded that I must have just been a bush swaying in the breeze… Well, I don’t know what he thought, but he resumed his interrupted serenade. That stick-like object in front of him is a dry grass stalk. See how much tinier his little front legs are than the dry grass? This puffy looking little toad was just as tiny as those in my preceding posts, but it was pudgy looking. I have speculated about it. Could it have suffered an injury, like perhaps a sting from a wasp? Has it the ability to puff up as some sort of self-protection mechanism? Or is it simply a different variety of toad? 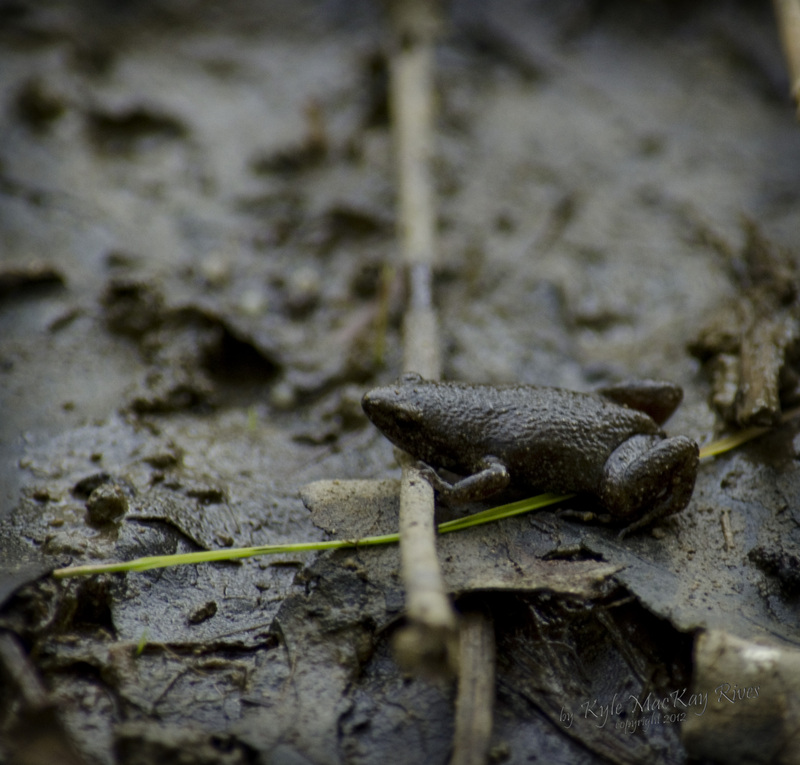 It was the only one like this I spotted, but that is the case for the tiny green and mud-colored frog from an earlier post, so it is probably not a significant fact. The toad acted pretty much like all its other minuscule cousins, so if it had sustained an injury, it did not appear to be life threatening. 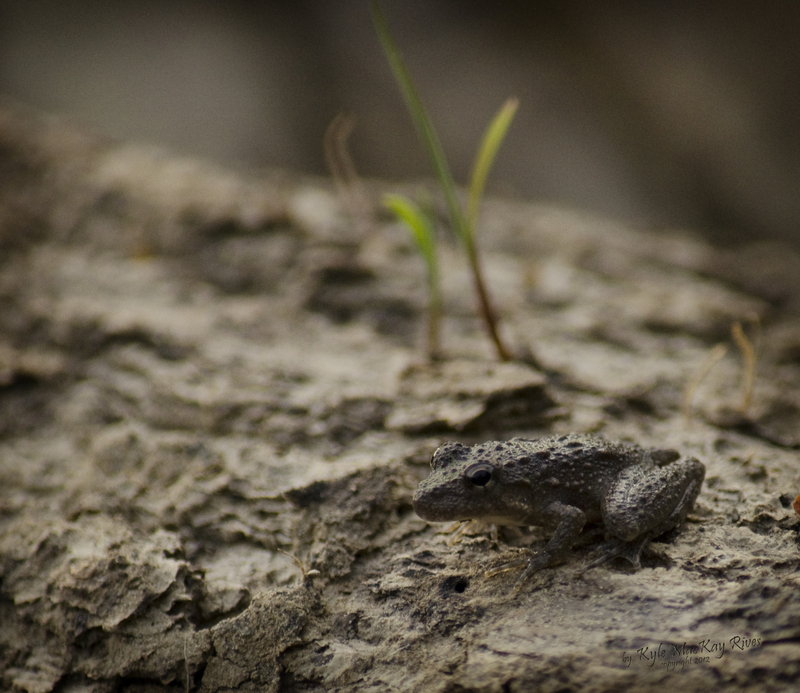 Another of the many minuscule amphibians populating the pond banks. Notice the size of the toad in comparison to the new sprig of grass behind it. It is far smaller in life than it appears on your computer screen! When I walk around the pond, many things move. Dragonflies zoom past, of course. Grasshoppers frantically hop out of the way, the cicadas cease their urgent buzz, water birds hurry away on whistling wings, and turtles silently submerge. 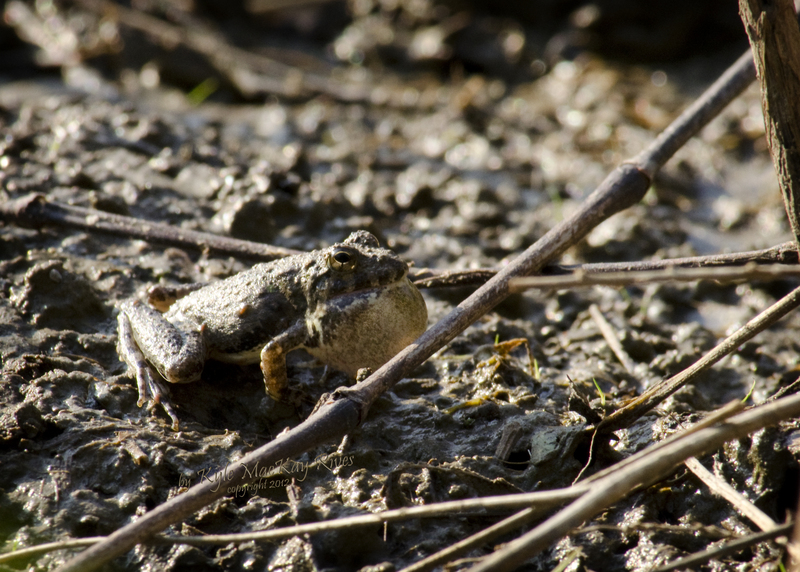 But small things hop away across the mud, tiny quick-moving things. When they land, they immediately freeze and blend into their surroundings so well they can only be seen if you followed the motion with your eyes and did not look away. What are they? 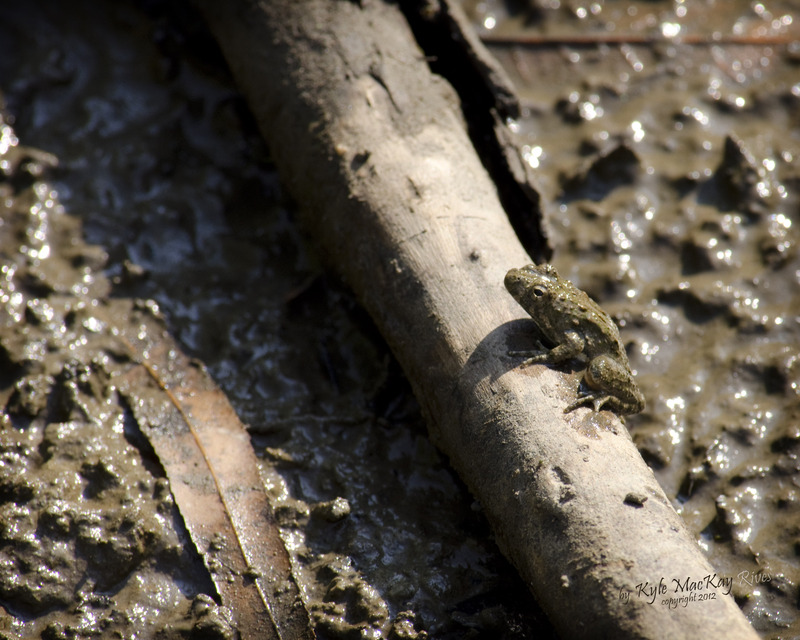 I sat out on a log by the pond with my camera, watching and attempting to capture images of these small hoppers. 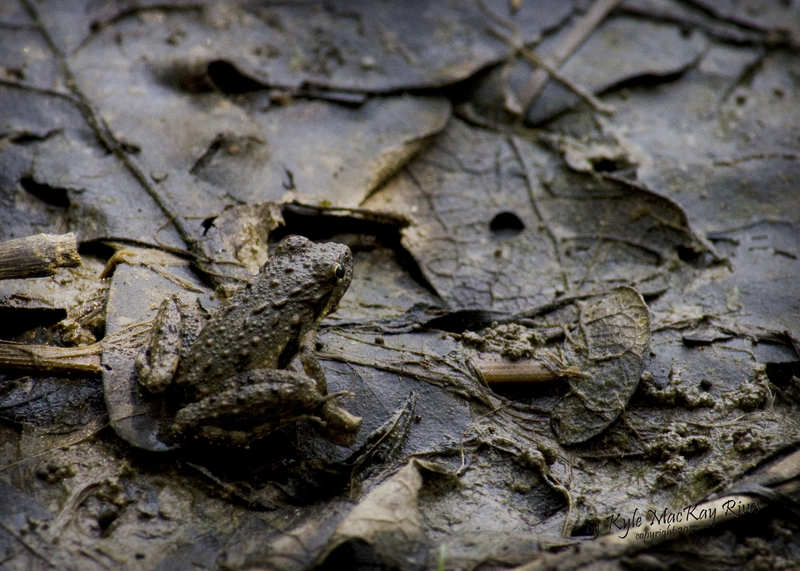 What I caught were images of an amazing variety of teeny, tiny toads and frogs! As you can see, even cropped for maximum visibility they are extremely well camouflaged. Tiny toad versus butterfly! Who will survive? Actually, the toad held perfectly still and ignored the butterfly as it walked past, picking up moisture from the mud with its proboscis. 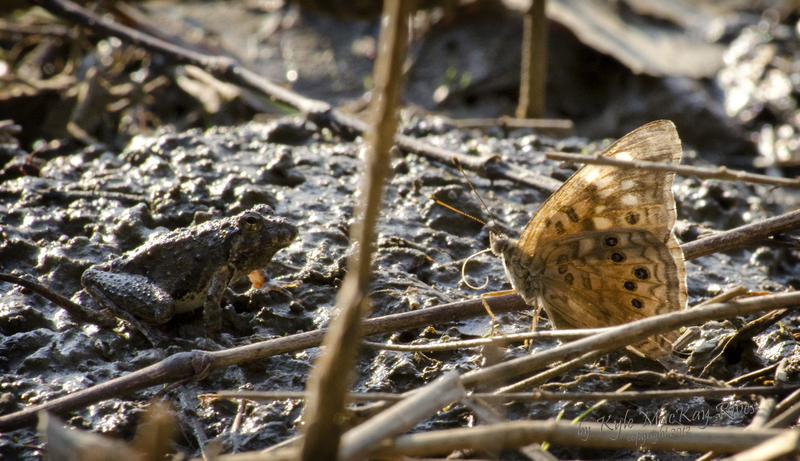 The butterfly seemed totally oblivious to the toad (which really resembled at tiny bump of mud)… If it had been a larger toad, I think the butterfly would have become dinner. Maybe. Just in case the photo doesn’t make it plain, I want to tell you this is a truly tiny toad, around 1/2 inch long!